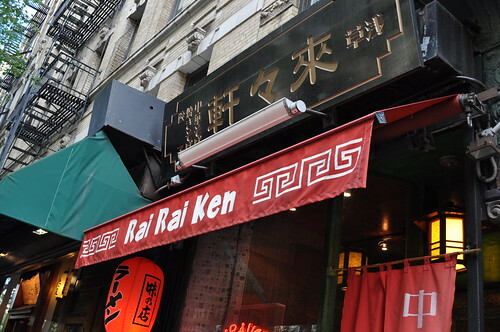 Last weekend, Marcus and I decided to have a quick dinner at Rai Rai Ken. I've heard many great things about this place from Derek and general food press, so I wanted to give it a try. I'm a big fan of Ippudo (incidentally, Marcus took me there for one of our first dates) and its signature ramen, the Akamaru Modern. The soup base (an original version of the Japanese tonkotsu) has so much depth to its flavor--it is definitely difficult for any place that serves ramen noodles to be able to top that. One that can be considered an equal contender in my book is Ramen Santouka (located inside Mitsuwa Marketplace, the largest Japanese supermarket in the U.S., in Edgewater, New Jersey), mainly because it also uses tonkotsu-salt in its base. 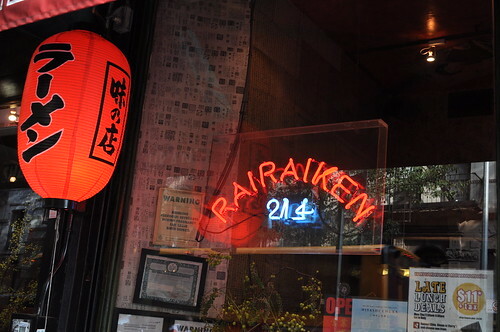 Rai Rai Ken's neon-powered signage appearing in its window. Abbreviated menu offered at Rai Rai Ken (I only took a portrait sized photo of part of the menu). 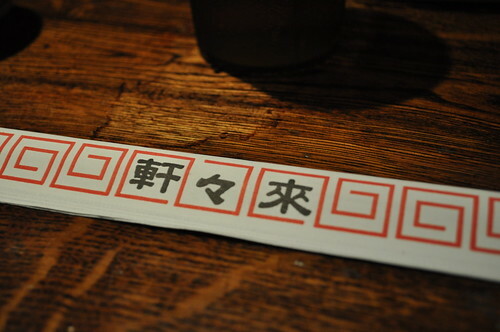 Rai Rai Ken's chopstick packaging. I ordered the miso ramen, as recommended by my "go-to" foodie friend, Derek, who will be making guest posts soon, I hope! 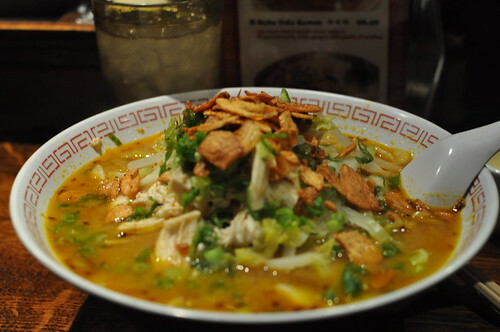 The miso ramen is a soybean-based noodle soup with bean sprout, cabbage, onion, crispy garlic, chicken, and scallion. Look at that mountain of crispy garlic! Even though my breath was super garlicky after upon finishing the noodles, it was well worth it! I looove garlic, so this was perfect for me! The soup base has almost as much character as Ippudo and also very, very similar to the one at Ramen Santouka. Only complaint from me here is that the chicken was kind of overcooked. I should've asked to substitute the chicken with roast pork for an extra $3--I'm sure it would've made it even better! I mean, as you'll see below, Marcus's ramen noodles included roast pork, and he said it was very tasty (a word which I rarely use, mainly because I just don't like the way it sounds, haha, but that's a blog post for another day). Marcus ordered the shio ramen, which is a house special seafood-based noodle soup topped with bamboo shoot, boiled egg, roast pork, spinach, fish cake, dry seaweed, and scallion. Marcus told me it was a pretty standard bowl of ramen noodles, typical in flavor all-around, and he felt that it didn't stand out as much as the soup base in Ippudo's Akamaru Modern ramen dish. I would have to agree with him there. 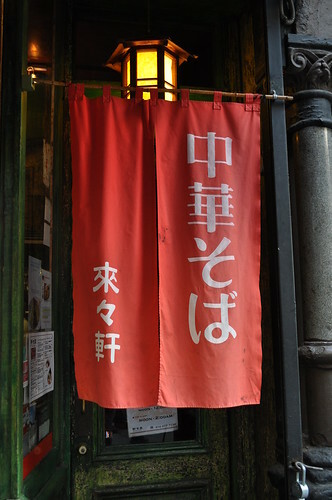 Welcome banners written in Japanese at Rai Rai Ken's front entrance. Findings: Marcus and I definitely found Ippudo to be more unique in taste and presentation. However, the downsides at Ippudo are its relatively long wait for an open table as well as its higher price point (nearly double the cost at Rai Rai Ken and Ramen Santouka). 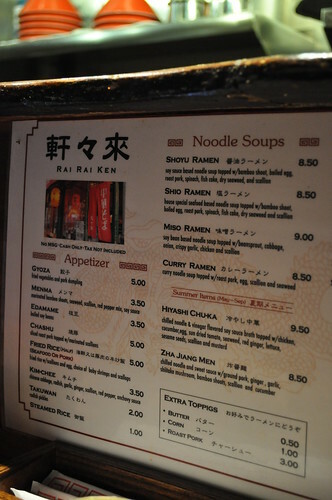 While Ippudo makes for a great place to take out-of-town guests and to go out for special occasions, Rai Rai Ken is a safe bet for a quick bowl of great-quality ramen noodles at a less steep price. Recommended for a midnight snack after a night out on the town, for sure! 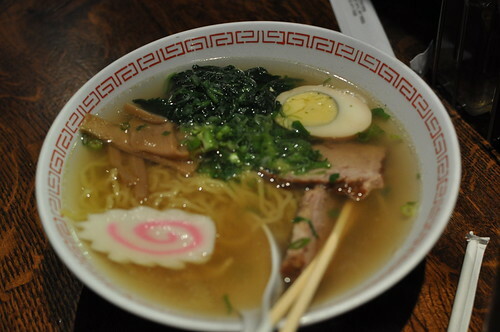 Price point: $9 for miso ramen; $8.50 for shio ramen.